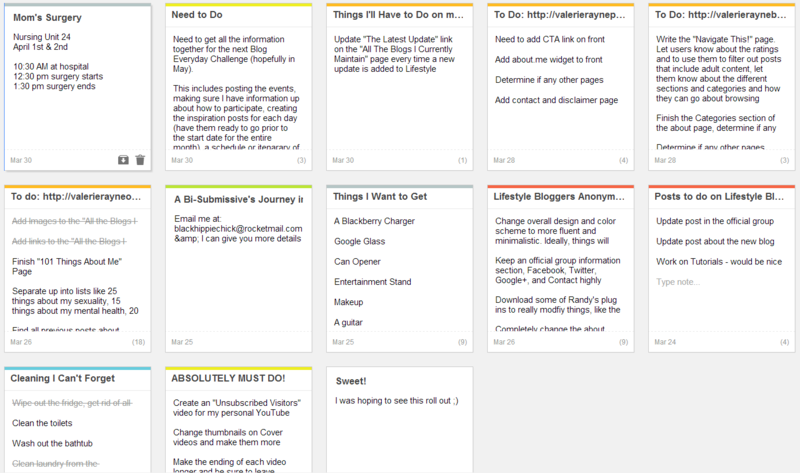 So I’ve been a little addicted to the new Google Keep and have a whole bunch of to-do lists going on right now of all the stuff that I’ve got to get done. I’ve gotta call about my Mom’s surgery on Monday, after she’s been taken in, just to check that everything’s alright. I’ve got to work on The Blog Everyday Challenge, which I’ve hugely neglected and haven’t even looked at in over a month. I’ve spent the last two days in a very quiet state, my mind whirring with thoughts about just about everything. I’m still stuck on The Boyfriend’s unwillingness to compromise, so that’s been on my mind non-stop. I haven’t had even one second to have a discussion with him since there’s been no days off and when he gets home from work, all he wants to do is get on the games with his work buddies. Not only is he playing with some of them on the Xbox, now he’s also playing with them on Star Trek: Online. I guess it’s okay though, because I’m still trying to figure out what exactly I plan to say, which I’m at an absolute loss for words. I don’t even know how to broach the subject or what to say once I broach it. I can’t make him enjoy something that he doesn’t and I’m not the type to give ultimatums, so it’s a little hard to find the words. Other than that, it’s been pretty boring around here and not much has really happened. No plans for Easter either. How’s your Easter weekend going? Categories: Family & Friends, Health & Happiness, Life & Love, Passions & Hobbies | Tags: Facebook, Google Keep, Google Tasks, Kids, Minecraft, Nerdy Journey, Sims 3, Star Trek Online, The Blog Everyday Challenge, The Boyfriend, To Do List | Permalink.